We’re going to show you how to add a Run Command to your start menu and configure it in such a way that you will have elevated privileges whenever you use it and avoid the UAC warnings and prompts. This saves you time and keeps you from being annoyed by UAC. Best of all, it’s easy to do. Right-click on the CMD shortcut and choose “Pin to Start Menu”. Click Start again. Right-click the Command Prompt shortcut you just added above and choose “Properties”. 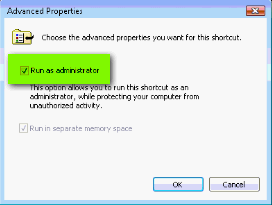 Click the Advanced button and click to select the “Run as administrator” checkbox. Windows 7 users can also add the Run Command to the Taskbar. If you choose this option, you’ll have to right-click on the icon and choose “Run as Administrator” each time you use it. Followed all the instructions here right up to click “Run as Administrator”. Couldn’t do that because that option is not available on my Vista laptop. Even took a Faststone Capture to show you but can’t send that with this. I will attempt this on my Windows 7 and hopefully have success there. It works on Vista and Windows 7. You’re missing the Advanced button the properties dialog. 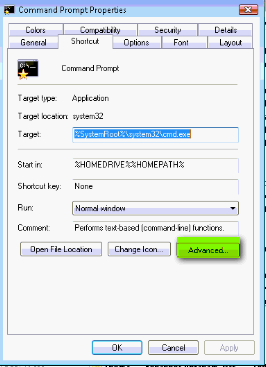 cmd properties -Advanced button does not yield a checkbox as an option. It only yields Advanced Attributes, (File attributes) – (Compress or Encrypt attribites) checkboxes. The screen shots were taken from a Vista Home Premium Desktop computer. I also have the same options on Windows Vista Home Premium laptop. EB has the same options on her Windows Vista Home Premium laptop. Unless you’re using Windows Vista Basic or you aren’t logged in as an administrator it makes no sense why you don’t have the same options. Microsoft shows the same information as well. I’m not loged in as administrator. In Vista after you click the advanced button it does not yield a ( Run as Administrator ) checkbox anywhere. All Windows Vista computers contain this dialog. You can only get to that dialog by typing CMD in your start menu search. Then clicking “Pin to Start Menu”. The opening your start menu, right-clicking on CMD shortcut, selecting “Properties” from there. You cannot get that dialog any other way I know of. And you must be logged into Windows as an admin. I can not seem to be able to find out how logging into Vista as Administrator is accomplished. I’m starting to feel really dumb. I guess my true level of mental ability is starting to rear it’s uugly head. Do you login to your computer? What kind of user account did you set up? Did someone else tell you to use a limited account? I don’t have enough info to help.